Text Introduction: At various times this year, I want to do some major teaching on our core values as a church. I have suggested that we adopt these four core values as a church. We much preach the same Gospel. We much declare this message to the next generation. We must preach this same Gospel to all the nations. Whatever we accomplish must be all for God’s glory. So, in this year, I want to spend a specific amount of preaching time preaching through these four core truths that we hold. Last week I shared with you from the book of Daniel concerning “Satan’s Strategy against the Next Generation.” We left off with just a bit about the hope that we have to reach the next generation. Today, I want to turn our attention to a positive example of one family reaching the next generation in their home even in the midst of impossible circumstances. The family is the family of Moses. Text: 1 Now a man from the family of Levi married a Levite woman. 2 The woman became pregnant and gave birth to a son; when she saw that he was beautiful, she hid him for three months. 3 But when she could no longer hide him, she got a papyrus basket for him and coated it with asphalt and pitch. She placed the child in it and set it among the reeds by the bank of the Nile. 4 Then his sister stood at a distance in order to see what would happen to him. 5 Pharaoh's daughter went down to bathe at the Nile while her servant girls walked along the riverbank. Seeing the basket among the reeds, she sent her slave girl to get it. 6 When she opened it, she saw the child—a little boy, crying. She felt sorry for him and said, "This is one of the Hebrew boys." 7 Then his sister said to Pharaoh's daughter, "Should I go and call a woman from the Hebrews to nurse the boy for you?" 8 "Go." Pharaoh's daughter told her. So the girl went and called the boy's mother. 9 Then Pharaoh's daughter said to her, "Take this child and nurse him for me, and I will pay your wages." So the woman took the boy and nursed him. 10 When the child grew older, she brought him to Pharaoh's daughter, and he became her son. She named him Moses, "Because," she said, "I drew him out of the water." 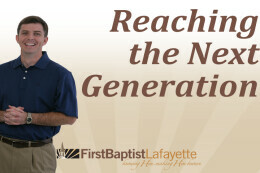 Introduction: Last week after preaching on the subject of “Satan’s Strategy to Steal the Next Generation,” I was immediately reminded of how serious this topic of reaching our next generation is. Last Sunday, in our local paper there was an AP (Associated Press) article on the research of fellow Southern Baptist Thom Rainer, the President of Lifeway, our denominational producer of most of our educational literature. The research is on those 18-29 years old. The research indicated that only about 15 % in this age group are committed to Jesus Christ. I went online to read the beginning of Dr. Rainer’s research. Rainer writes just how gloomy our predicament is if something does not drastically change. On the current trajectory of the Millennials, thousands of churches will close in America each year. I expressed concern that once-healthy denominations are becoming unhealthy. I expressed concern that some of the thriving ministries of today are in great jeopardy if the trends of the Millennials continue. But those concerns are not of paramount importance. The greatest concern is that millions of young people do not have a personal relationship with Jesus Christ. They are lost in their present spiritual condition. Listen to how the writer of Hebrews described this faith action of Moses’ parents. Parents, we need faith if we have a chance to reach this generation—faith to make some hard decisions. ­­­­­­­­Wise Planning­ is the Protection. Guided by what was right for Moses. There were actually 3 stages of plans. The first was to hide him. Then they put Moses in the river to watch. This led to being in Pharaoh’s court. He came back home with his parents. Then, the third stage was for him to return to Pharaoh’s household. The plans changed as they needed. We must be guided by what is right for our children. Your children do not exist for you. God did not give them to you so that they would become what you want them to be. Instead, your goal ought to be to help them to discover what God wants them to be. Chuck Swindoll calls this a “bent.” Your child has a bent. That verse in Proverbs that tells us as parents to “Train up a child in the way he should go and when he is old he will not depart from it” speaks to this bent that your child has in the LORD. Faith is not inactivity, but rather action while we trust God for the outcome. God’s Providence is the Promise. The Let Go Principle—Psalm 127 also tells us that children are like arrows in the hands of a warrior. Somebody said the most difficult thing about shooting an arrow is letting go. But, as parents, we have to let go. Dr. Rainer said there is some good news. In fact, listen to his words. We did find some hope in the midst of the bad news. Although the relative number of Christians in this generation is small, those who are Christians are more likely to have a radical commitment to the gospel than Christians in previous American generations. Millennial Christians will not settle for business as usual in our churches. They will not be content with going through the motions, programs without a purpose, and spectator Christianity. They take their faith seriously, and they have little patience with churches that focus most of their resources on the members. These Millennials are serious about taking the gospel to the nations and to their communities. In the midst of all the bad news, there is good news. Radical commitment from radical Christians. If a few Christians turned the world upside down in the first century, we have no reason to doubt that a few million can do it again in the twenty-first century.